As part of the Princeton Web Transparency and Accountability Project (WebTAP), we wanted to understand more about headlines. How often do news publishers change headlines on articles? Do variations offer different editorial slants on the same article? Are some variations ‘clickbait-y’? To answer these questions we collected over ~1.5 million article links seen since June 1st, 2015 on 25 news sites’ front pages through the Internet Archive’s Wayback Machine. Some articles were linked to with more than one headline (at different times or on different parts of the page), so we ended up with a total of ~2.5 million headlines. To clarify, we are defining headlines as the text linking to articles on the front page of news websites — we are not talking about headlines on the actual article pages themselves. Our corpus is available for download here. In this post we’ll share some preliminary research and outline further research questions. We were limited in our analysis to how many snapshots of the news sites the Wayback Machine took. For the six months of data from 2015 especially, some of the less-popular news sites did not have as many daily snapshots as the more popular sites — the effect of this might suppress the measure of headline variation on less popular websites. Even so, we were able to capture many instances of articles with multiple headlines for each site we looked at. We took a first pass at our data using an open source library to classify headlines as clickbait. The classifier was trained by the developer using Buzzfeed headlines as clickbait and New York Times headlines as non-clickbait, so it can more accurately be called a Buzzfeed classifier. Unsurprisingly then, Buzzfeed had the most clickbait headlines detected of the sites we looked at. 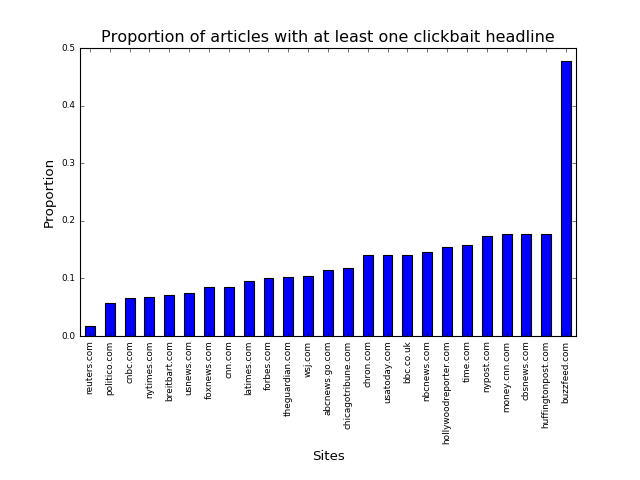 Overall, we found that at least 10% of headlines were classified as clickbait on a majority of sites we looked at. We also found that overall, clickbait does not appear to be any more or less common now than it was in June 2015. The facts implied by these headlines are different in a very important way. The second headline, unlike the first, can cause a reader presuppose that the Sanders campaign did do something wrong or malicious, since they are being punished. The first headline hedges the story significantly, only saying that the Sanders campaign may have done something “improper” — the truth of that proposition is not suggested. The researchers identify this as a bias of entailment. Using a modified version of the biased-language lexicon, we looked at our own corpus of headlines and identified when headline variations added or dropped these biased words. We found approximately 3000 articles in which headline variations for the same article used different biased words, which you can look at here. From our data collection we clearly have evidence of editorial bias playing a role in the different headlines we see on news sites. While identifying bias in 3000 articles’ headlines is a start, we think we’ve identified only a fraction of biased articles. One reason for missing bias is that our heuristic defines differential bias narrowly (explicit use of biased words in one headline not present in another). There are also false positives in the headlines that we detected as biased. For instance, an allegation or an accusation might show a lack of neutrality in a Wikipedia article, but in a news story an allegation or accusation may simply be the story. – Without clear guidelines, finding bias in headlines is a more subjective exercise than finding it in Wikipedia articles. 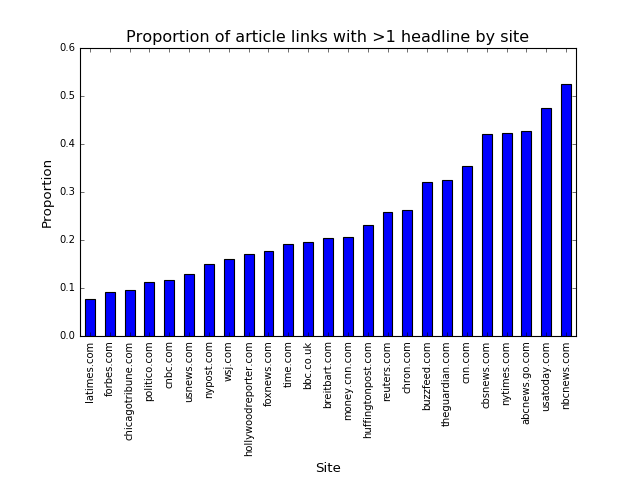 – Headlines are more information-dense than Wikipedia articles — fewer words in headlines contribute to a headline’s implication. – Many of the stories that the news publishes are necessarily more political than most Wikipedia articles. If you have any ideas on how to overcome these obstacles, we invite you to reach out to us or take a look at the data yourself, available for download here. Our main measurements ignore subpages like nytimes.com/pages/politics, which appear to often have article links that are at some point featured on the front page. For each snapshot of the front page, we collected the links to articles seen on the page along with the ‘anchor text’ of those links, which are generally the headlines that are being varied. In 2014, Facebook revealed that they had manipulated users’ news feeds for the sake of a psychology study looking at users’ emotions. We happen to know about this particular experiment because it was the subject of a publicly-released academic paper, but websites do “A/B testing” every day that is completely opaque to the end-user. Of course, A/B testing is often innocuous (say, to find a pleasing color scheme), but the point remains that the user rarely has any way of knowing in what ways their browsing experience is being modified, or why their experience is being changed in particular. That means that the data collected by our large-scale web crawler OpenWPM contains the details of all the experiments that are being run across the web using Optimizely. In this post I’ll show you some interesting things we found by analyzing this data. We’ve also built a Chrome extension, Pessimizely, that you can download so you too can see a website’s Optimizely experiments. When a website uses Optimizely, the extension will alert you and attempt to highlight any elements on the page that may be subject to an experiment. If you visit nytimes.com, it will also show you alternative news headlines when you hover over a title. I suggest you give it a try! The New York Times website, with headlines that may be subject to an experiment highlighted by Pessimizely. 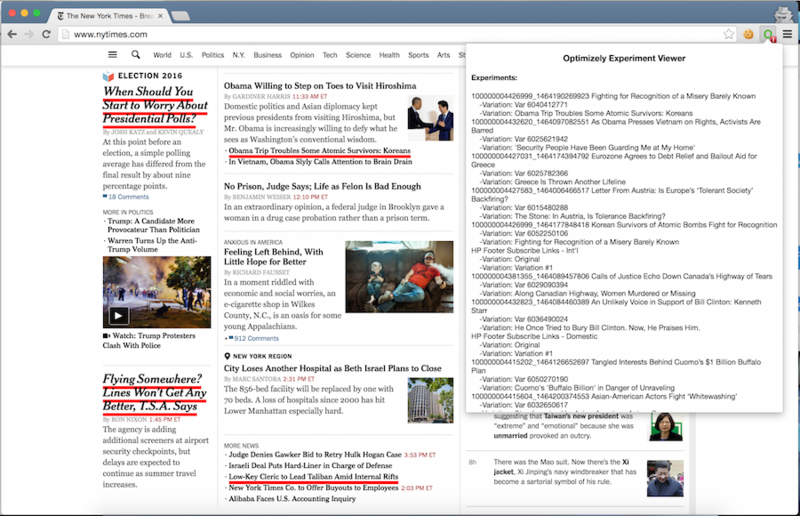 An example of an experiment from nytimes.com that is A/B testing two variations of a headline in a link to an article. How the website owner wants to divide users into “audiences,” based on any number of parameters like location, cookies, or user-agent. Experiments that the users might experience, and what audiences should be targeted with what experiments. We were able to identify 17 different news websites in our crawl that in the past have done some form of headline testing. This is most likely an undercount in our crawl — most of these 17 websites use Optimizely’s integrations with other third-party platforms like Parse.ly and WordPress for their headline testing, making them more easily identified. The New York Times website, for instance, implements its own headline testing code. Another limitation of what we’ve found so far is that the crawls that we analyzed only visit the homepage of each site. The OpenWPM crawler could be configured, however, to browse links from within a site’s homepage and collect data from those pages. A broader study of the practices of news publishers could use the tool to drill down deeper into news sites and study their headlines over time. Non-profit websites also experiment with money. charity: water (charitywater.org) and the Human Rights Campaign (hrc.org) both have experiments defined to change the default donation amount a user might see in a pre-filled text box. We might see these unusual uses because Optimizely allows developers to edit and rollout new code with little engineering overhead. With the inclusion of one third-party script, a developer can leverage the Optimizely web interface to do a task that might otherwise take more time or careful testing. This is one example of how third-parties have evolved to become integral to the entire functionality and development of the web, raising security and privacy concerns. Much of the web is curated by inscrutable algorithms running on servers, and a concerted research effort is needed to shed light on the less-visible practices of websites. Thanks to the Optimizely platform we can at least peek into that secret world. * This was a conversation a year ago, when Jonathan was a grad student at Stanford. Over the past three months we’ve learnt that NSA uses third-party tracking cookies for surveillance (1, 2). These cookies, provided by a third-party advertising or analytics network (e.g. doubleclick.com, scorecardresearch.com), are ubiquitous on the web, and tag users’ browsers with unique pseudonymous IDs. In a new paper, we study just how big a privacy problem this is. We quantify what an observer can learn about a user’s web traffic by purely passively eavesdropping on the network, and arrive at surprising answers.